For each of the past several years, there is one question certain to be asked on the final night of our Run For God 5k program: "Have you ever thought of doing a 10K training?" And each year I reply with, "Well, there is a RFG 10k book and plan, but it's difficult to hold both of them together - maybe someday." However, with our group this past May the number of those raising this question increased to such a point that the request could no longer be ignored. 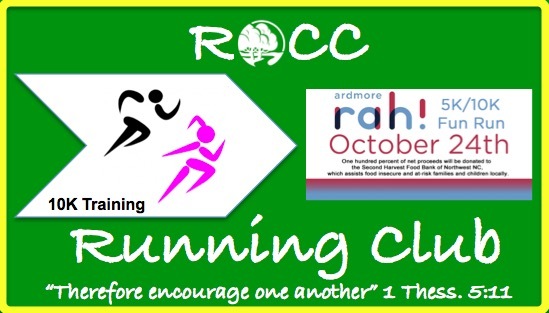 Beginning tonight, Tuesday - September 1st - @ 6:30 pm, we will kickoff the ROCC (River Oaks Community Church) Running Club. Our primary purpose is to honor God in our running (words, attitudes, actions, encouragement, gratitude, and perspective) as we train for the Ardmore RAH 10k to be held on October 24th. The training is 8 weeks and will be based on Hal Higdon's Novice / Intermediate plans. The Ardmore event is a Run Against Hunger race and is also one of Fleet Feet's We Run Winston premier races (similar to the ROCC 5k). You can certainly chose to walk / run your race as our goal is for you to complete your first or your fastest 10k. We begin tonight with a 2.5 mile training run. That might sound too difficult, and yes, it should be somewhat difficult (no pain, no gain, right! ), but if you could go out and complete a 5k today in some manner of completion, you will be perfectly fine with our training. The key is slowing the pace and to just keep putting one foot in front of the other. There are no costs associated with this training, other than your race entry fee, and this is not a Run For God program. We will meet and run. While doing so, we will fellowship through our runs, provide some devotional conversation during our warm-ups, and talk through some distance running tips and observations during our cool-down. Finally, I'll try to use the RWH site and the Triad Run For God Facebook page to update everyone on group run locations, but many will be from the church, especially on Tuesdays and Thursdays. Share with a friend or neighbor as all are welcome, and hope to see you at RRC tonight!